Dardik, Gross & Co. law firm is a member of ALFA International, the global legal network. 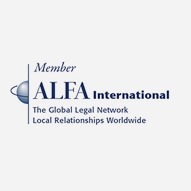 With 145 member firms in the United States, Canada, Mexico, Latin America, Europe, Asia, Australia, New Zealand, and Africa, ALFA International is the premier global network of independent law firms. ALFA International’s success is driven by its members’ broad and deep, local relationships both in the United States and throughout the world. ALFA International’s mission is to provide clients with high-quality, cost-efficient legal services worldwide. The ALFA International model enables Dardik, Gross & Co. to use its local expertise to deliver highly effective legal solutions, while drawing upon the collective wisdom and experience of other member firms within the United States and around the world as needed. Dardik, Gross & Co. clients’ also benefit from a wide range of unsurpassed educational programming including: seminars, webinars, legal compendia, etc. More information is available at www.alfainternational.com.